It’s Student Volunteer Week—Victoria University will be celebrating the many volunteers who make a difference in our community, and encouraging students to give volunteering a go. Read Ankita Parmar’s student volunteer story. When I first arrived at Victoria University in March 2017 from India, I didn’t know anyone. I was on the lookout for a community to join that I was both passionate about and could help me meet new people, and the Victoria Fruit and Vegetable Co-op caught my eye. The Victoria Fruit and Vegetable Co-op distributes fresh and affordable produce across the University’s campuses each week, contributing to a healthy food environment for staff and students, and aligning with Victoria University’s status as a health-promoting university. The Co-op could not function without the support of its volunteers, who help collect, pack and distribute orders to the Co-op’s members. Volunteering is not a job that you have to do. It’s something that you are so passionate about that you want to do it. I joined the Victoria Fruit and Vegetable Co-op as a volunteer because I understand the important role fresh fruit and vegetables play in health and wellbeing, and the Co-op makes healthy food accessible to our community. In simple words, I believe in what the Co-op stands for. My first volunteer role was as a packer. Fruit and vegetable orders are packed up for collection every Thursday, and there are multiple stages to this weekly pack out—we unload the produce from the delivery trucks, set up the tables, prepare the correct number of bags for the orders, and pack all of the orders, ready for collection by our Co-op members. The pack out reminds me of a movie in which Santa’s elves in the North Pole worked together to pack Christmas gifts for children. There’s a real sense of excitement as we work together as a team, enjoying ourselves throughout the process. We play music, we chat. We are one big community. After some time as a packer, I became the pack out coordinator. I would weigh the produce and make sure what we packed matched the number of orders received for each campus. I currently prepare the order lists for each campus and manage our database. 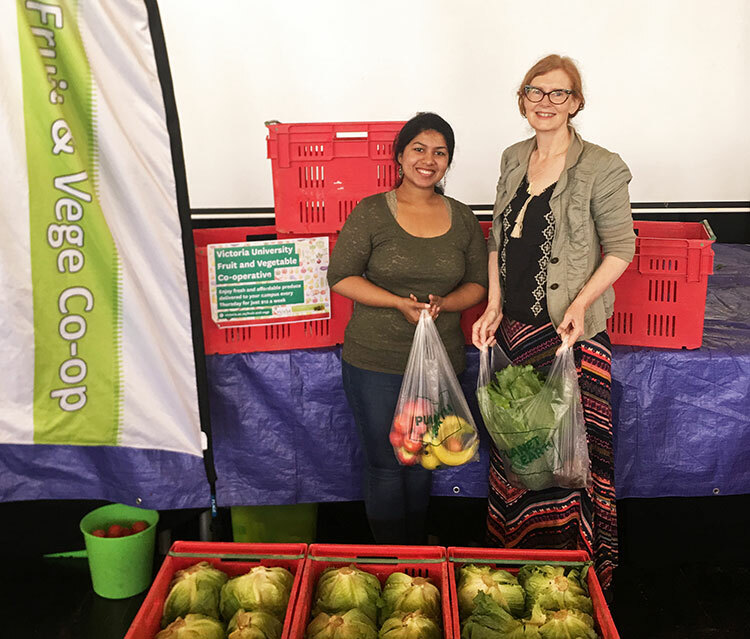 I’ve never been daunted by the increased responsibility, due to the support of the Victoria Fruit and Vegetable Co-op organiser and Wellbeing Advisor at Mauri Ora, Catherine Nelson. Catherine is always there when I need support or guidance, and she is both my friend and mentor. I’ve made a few mistakes, but due to the Co-op’s support, I’ve never lost confidence in myself. There are so many ways to be involved in the Co-op. I do miss being a part of the pack out, but I’m glad to still be a part of the community. Volunteering for the Co-op also helps me gain points for the Victoria Plus Award, which is an added bonus. Ankita Parmar is a Master of Professional Accounting student and volunteers for the Victoria University Fruit and Vegetable Co-op.